Stauthammer C., Tobias A., France M., Olson J. Caudal vena cava obstruction caused by redundant pacemaker lead in a dog // J Vet Cardiol. 2009 Dec;11(2):141-5. Inferior vena cava obstruction, a rare but serious complication of transvenous pacemaker lead placement in humans, has not been reported in dogs. We describe this complication in a dog that developed ascites 8 months after pacemaker implantation. Radiography disclosed a loop of redundant lead within the caudal vena cava (CVC), and angiography demonstrated obstruction to blood flow. Withdrawal of the loop from the CVC did not restore blood flow. Persistent obstruction was suspected secondary to fibrosis resulting from vascular damage caused by the loop of lead. Angioplasty of the CVC obstruction restored blood flow and resolved the dog's clinical signs. A 7-year-old female spayed Shetland Sheepdog weighing 13 kg was presented to the Cardiology Service, University of Minnesota Veterinary Medical Center in February 2007 for evaluation of syncope and bradycardia. Syncope first occurred in November 2006 and had progressed in frequency to eight episodes per day by the time of presentation. Physical examination disclosed a heart rate of 40 bpm with synchronous hyperkinetic femoral pulses, an irregular rhythm, and a grade 2/6 left basilar systolic murmur. Thoracic radiographs demonstrated mild generalized enlargement of the cardiac silhouette with a vertebral heart score (VHS) of 11.6,1 and unremarkable pulmonary vasculature and parenchyma. An electrocardiogram identified second degree atrioventricular block that varied in severity from 3:1 to 10:1. Transthoracic echocardiography demonstrated cardiac dimensions within reference range for a weight-matched dog.2 Color-flow Doppler demonstrated mild systolic mitral valve regurgitation, and mild low velocity diastolic mitral and tricuspid valve regurgitation associated with non-conducted P waves. Peak aortic systolic flow velocity measured with pulsed wave Doppler was 2.3 m/sec. The patient was scheduled for transvenous pacemaker implantation the following day. The patient	was	premedicated	with 0.008 mg/kg acepromazine, 0.27 mg/kg butorphanol, and 0.8 mg/kg ketamine administered intravenously (IV). Anesthesia was induced with 0.19 mg/kg diazepam and 1.9 mg/kg ketamine IV, and maintained with isoflurane in 100% oxygen and a constant rate IV infusion of ketamine at 0.7 mg/kg per hour. Dobutamine was also administered as a constant rate IV infusion at 5 mg/kg per min, and 23 mg/kg of cefazolin was administered IV every 120 min. The right jugular vein was exteriorized and incised for placement of a tined bipolar silicone insulated endocardial pacemaker lead.a Under fluoroscopic guidance, the lead tip was directed to the apex of the right ventricle. However, pacing thresholds in this location were excessively high, and the lead tip was repositioned towards the right ventricular outflow tract region where good pacing thresholds were obtained (<0.5V with a pulse duration of 0.5 msec). Lead impedance was 600—800 ohms, and intrinsic R waves were 8 mV. Additional lead was then advanced into the jugular vein to prevent dislodgement, and the lead was secured with lig- aturesb placed around the lead’s suture sleeve. The lead was then connected to the pacemaker generator, which was placed in a subcutaneous pocket caudal to the scapula. The pacemaker generator was programmed to VVI mode at a rate of 70 bpm, a pulse amplitude of 5 V with a pulse duration of 0.4 msec, and ventricular refractory period of 330 msec. Recovery was uneventful, and the dog was discharged 2 days after the procedure on 19 mg/kg amoxicillin and clavulanic acidc PO q12 h for 10 days, and tramadold to be provided as necessary at 2 mg/kg PO q8 h. Pacing threshold at the time of discharge was 0.5 mV with a pulse duration of 0.4 msec. The dog was reassessed twice during the 2 months following pacemaker implantation. She responded well clinically, and showed increased energy and no further syncope. At both visits, pacemaker interrogation disclosed a small increase in the pacing threshold (1 mV with a pulse duration of 0.4 msec at both visits). The pacemaker generator was reprogrammed to VVIR mode, with a rate range of 60—180 bpm and a mild to moderate activity level algorithm. No other pacemaker programming changes were made at these visits. Thoracic radiographs were not taken during this time. Eight months after pacemaker implantation, the dog was presented for evaluation of ascites, diarrhea and lethargy of 1 week’s duration. Physical examination disclosed generalized muscle wasting, pale and tacky mucous membranes with a prolonged capillary refill time (3 s) and a non-dis- tended and non-pulsatile left jugular vein. The abdomen was severely distended, and an abdominal fluid wave and pitting edema of the hind limbs were present. The heart rate was regular (72 bpm) and synchronous with the femoral arterial pulse, and intermittent fourth heart sounds were present. Systolic blood pressure measured with an ultrasonic Doppler flow detectore was 94 mmHg. Pacemaker interrogation disclosed a normally functioning VVIR pacing system with appropriate pacing and sensing threshold values. Two liters of serosanguinous abdominal fluid was removed by abdominocentesis, and analysis of the fluid identified it as a modified transudate. A stress leukogram was present on complete blood count (total leukocytes 20.3 x 103/pL; ref range 4.1—13.3 x 103/pL, segmented neutrophils 18.5 x 103/pL; ref range 2.1—11.1 x 103/pL, lymphocytes 0.8 x 103/pL; ref range 0.7—3.4 x 103/pL, monocytes 1.0 x 103/pL; ref range 0—1.2103/pL). A marked thrombocytopenia (64 x 103/pL; ref range 160—425 x 103/pL) and mildly increased activated partial thromboplastin time (16.9 s; ref range 9.8—14.6 s) were also noted. Serum chemistry disclosed a marked azotemia (blood urea nitrogen 98 mg/dL; ref range 9—31 mg/dL, creatinine 3.4 mg/dL; ref range 0.6—1.6 mg/dL), hypoalbuminemia (2.3 g/dL; ref range 2.7—3.7 g/dL), hyponatremia (124 mmol/L; ref range 145—153 mmol/L), hypochloremia (97 mmol/L; ref range 109—118 mmol/L) and hyperkalemia (7.5 mmol/L; ref range 3.6— 5.3 mmol/L). Basal serum cortisol concentration was increased (13.5 pL/dL; ref range 0.5—4.0 pL/ dL). Thoracic radiographs demonstrated a small cardiac silhouette with a VHS of 9.0. The pacemaker lead tip was in a stable location in the right ventricle. However, a portion of the lead had formed a loop within the caudal vena cava (Fig. 1). M-mode echocardiography demonstrated decreased ventricular chamber dimensions (left ventricular diameter in diastole = 2.0 cm; ref range 3.1—4.5cm, and in systole = 1.1cm; ref range 1.8—3.2 cm). Abdominal ultrasonography revealed ascites and hepatomegaly with a coarse non-attenuating echogenicity. The hepatic veins were slightly distended. A non-selective caudal vena cavagram was performed by injecting 2 ml/kg non-ionic contrast mediumf into the left lateral saphenous vein via an 18 gauge catheter. The study demonstrated complete obstruction of caudal vena cava flow at the site of the loop of pacemaker lead. The loop was surrounded by a large filling defect suggesting an associated thrombus or fibrosis. Flow to the right atrium occurred exclusively via the vertebral sinuses and azygous vein. The cardiac silhouette is small (vertebral heart size = 9.0), and a loop of redundant pacemaker lead is present within the caudal vena cava. The patient was taken to the catheterization laboratory to attempt to alleviate the caudal vena caval obstruction. After premedication with 0.04mg/kg butorphanol and 0.1 mg/kg diazepam IV, anesthesia was induced with 0.5 mg/kg ketamine IV and maintained with isoflurane in 100% oxygen and 0.05 mg/kg etomidate IV boluses as necessary. The pacemaker lead was isolated from the subcutaneous tissues and the right jugular vein. Under fluoroscopic guidance, moderate traction was applied to the lead, and the loop within the caudal vena cava was withdrawn without dislodging the lead tip from the right ventricle. Excessive lead laxity was reduced by withdrawing 6 cm of lead from the jugular vein before securing it in place as previously described. After withdrawing the loop of pacemaker lead from the caudal vena cava, a non-selective caudal vena cavagram was repeated. This showed a persistent filling defect within the caudal vena cava and minimal flow through the site of obstruction into the right atrium. Consequently, a 7 French (Fr) vascular access sheathg was introduced into the left femoral vein. A 7 Fr angiographic catheterh was advanced via the sheath into the caudal vena cava, and a selective angiogram confirmed partial obstruction of the caudal vena cava (Fig. 2A; Video 1). Using the outer diameter of the angiographic catheter as a reference (1 Fr = 0.33 mm, therefore 7 Fr = 2.3 mm), caudal vena cava diameter was measured at between 9 and 10 mm. A 7 Fr end hole catheter* i was then maneuvered through the obstruction into the right atrium. Mean caudal vena cava pressure was 17 mmHg, while mean right atrial pressure was 3 mmHg. A J-tipped 0.035 inch diameter exchange wirej was then passed through the catheter into the right atrium, and the end hole catheter was removed. A valvuloplasty catheterk with a 12 mm diameter balloon (1.2—1.3 times the diameter of the caudal vena cava) was then passed over the exchange wire across the obstruction and inflated numerous times. An hourglass appearance was noted at the site of obstruction, and the waist diameter of the hourglass increased progressively with each inflation (Fig. 2B; Video 2). Following angioplasty, mean caudal vena cava pressure was 12 mmHg and mean right atrial pressure was 7 mmHg. A selective caudal vena cavagram demonstrated minimal residual narrowing and unobstructed flow from the caudal vena cava into the right atrium (Fig. 2C; Video 3). The dog recovered uneventfully and was discharged 2 days later. On a follow-up evaluation performed 2 weeks after pacemaker lead withdrawal from the caudal vena cava and angioplasty, ascites and hind limb edema had resolved. The complete blood count and serum chemistry panel were unremarkable. Thoracic radiographs demonstrated a substantial increase in the size of the cardiac silhouette (VHS = 11.2) and stable position of the pacemaker lead. On follow-up evaluations performed 7 and 13 months after the procedure, the dog continued to do well with no recurrence of ascites or peripheral edema. A filling defect is present at the previous site of the looped lead (arrow heads). A small amount of contrast medium passes around the edges of the filling defect to enter the right atrium. Filling of the right atrium occurs mainly via the azygous vein (AV). Retrograde flow of contrast medium opacifies the hepatic and epigastric veins (HVand EV, respectively). (B) Angioplasty of the caudal vena cava. The balloon shows a waist (arrow heads) during inflation (hourglass appearance), suggesting the presence of a ring of fibrosis. (C) Selective caudal vena cavagram following angioplasty showing minimal residual obstruction to normal blood flow from the caudal vena cava to the right atrium (RA). The amount and duration of retrograde flow of contrast medium in the caudal vena cava and the hepatic and epigastric veins is reduced and there is no opacification of the azygous vein. In the case described here, the suspected cause of the caudal vena cava obstruction included thrombosis, fibrosis, and adhesions. Non-selective and selective caudal vena cavagrams and pressure measurements demonstrated continued obstruction to flow despite withdrawal of the loop of lead from the vessel lumen. Angioplasty of the caudal vena cava disclosed an hourglass appearance at the site of obstruction, consistent with a circumferential fibrous ring or band. These findings suggest that the loop of pacemaker lead damaged the vascular endothelium with subsequent inflammation, thrombosis and fibrosis. The most frequent major complication associated with transvenous pacemaker implantation is lead dislodgement.11,12 In this case, additional lead was placed to reduce the risk of lead dislodgement. However, lead redundancy allowed a loop to form within the caudal vena cava, resulting in endothelial damage with fibrosis and stenosis of the vessel. This, in turn, led to post sinusoidal portal hypertension, and a modified transudate ascites. Caudal vena cava obstruction also decreased venous return to the heart despite the presence of collateral venous circulation. Decreased venous return and loss of water in the ascitic fluid led to diminished cardiac output and renal blood flow with secondary azotemia. Fortunately, this patient responded favorably to withdrawal of the pacemaker lead loop and angioplasty of the caudal vena cava, and showed complete remission of clinical signs despite a small residual pressure difference between the caudal vena cava and right atrium. Buchanan JW, Bucher J. Vertebral scale system to measure canine heart size in radiographs. J Am Vet Med Assoc 1995; 206:194-199. Cornell CC, Kittleson MD, Della Torre P, Haggstrom J, Lombard CW, Pederson HD, Vollmar A, Wey A. Allometric scaling of m-mode cardiac measurements in normal adult dogs. J Vet Intern Med 2004;18:311-321. Lu CL, Hwang SJ, Chen SA, Yu TJ, Chou YH, Lee SD. Budd- Chiari syndrome due to pacemaker induced thrombosis. J Gastroenterol Hepatol 1995;10:355-358. Simon RD, Irvine A, Jackson G. Inferior vena cava obstruction secondary to permanent pacing. Int J Cardiol 2000;75: 115-117. Connolly DJ, Neiger-Aeschbacher G, Brockman DJ. Tricuspid valve stenosis caused by fibrous adhesions to an endocardial pacemaker lead in a dog. J Vet Cardiol 2007;9: 123-128. 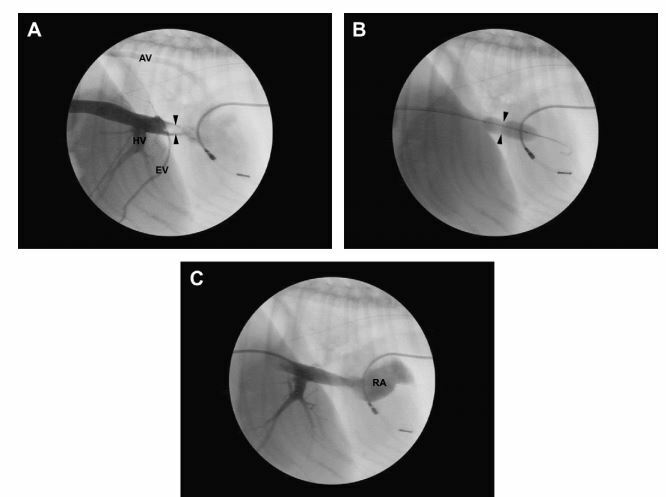 Taira K, Suzuki A, Fujino A, Watanabe T, Ogyu A, Ashikawa K. Tricuspid valve stenosis related to subvalvular adhesions of pacemaker lead: a case report. J Cardiol 2006; 47:301-306. Aryana A, Sobota KD, Esterbrooks DJ, Gelbman AI. Superior vena cava syndrome induced by endocardial defibrillator and pacemaker leads. Am J Cardiol 2007;99:1765-1767. HaghjooM, NikooMH, FazelifarAE, Alizadeh A, EmkanjooZ, Sadr-Ameli MA. Predictors of venous obstruction following pacemaker or implantable cardioverter-defibrillator implantation: a contrast venography study on 100 patients admitted for generator change, lead revision, or device upgrade. Europace 2007;9:328-332. Van De Wiele CM, Hogan DF, Green III HW, Parnell NK. Cranial vena caval syndrome secondary to transvenous pacemaker implantation in two dogs. J Vet Cardiol 2008;10: 155-161. Oyama MA, Sisson DD, Lehmkuhl LB. Practices and outcomes of artificial cardiac pacing in 154 dogs. J Vet Intern Med 2001;15:229-239. Johnson MS, Martin MWS, Henley W. Results of pacemaker implantation in 104 dogs. J Small Anim Pract 2007;48:4-11.